Brass is a highly attractive metal used in decorative items, musical instruments and jewelry. While highly reflective and shiny when clean, it easily tarnishes from contact with skin oils or with compounds in the air. Removing tarnish is not difficult and several brands of brass and metal cleaners are available to remove tarnish without much physical effort. 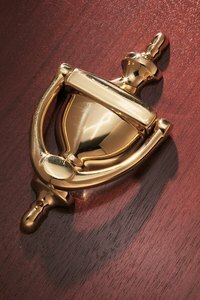 Periodic scheduling of some time with brass cleaner is the only way to keep the items looking clean and tarnish free. Wipe the brass down with a clean cloth to remove any dust, debris, cobwebs, or other foreign material. Lay an old towel on a table and set the brass item on it. Pour some commercial brass cleaner liquid onto a clean cloth. Begin working it slowly over the brass surface. You will see an immediate brightening of the brass from the compound. Work in small circular motions across the brass face and continue until the entire item is clear of tarnish. Dip the tip of a cotton swab into a small bowl filled with brass cleaner. Use the cleaner to clean the tarnish from hard-to-reach spaces. Polish the surface by buffing with another clean cloth. This removes excess cleaner and improves the shine on a brass surface. Once clean, use a cloth or gloves to handle the brass item. This keeps tarnish from forming too soon from the oils on your skin. Avoid the use of abrasive cleaners or a compound containing ammonia, as this can damage the brass.